Another Madden NFL 18 title update has arrived today, check out the patch notes below and let us know what you’re seeing! It’s about time those cut blocks were being taken care of. Swear, those almost made me uninstall alone. "Tuned to improve the play of AI-controlled QB’s, specifically around scrambling and recognizing pressure"
"The team is aware of an issue in Franchise mode where users may experience lag during play call on PS4. We want our PS4 franchise players to know this issue is a top priority for our team, and we will do our best to get the issue resolved as soon as possible. We apologize for the inconvenience and thank you for your continued patience." Are you kidding me? Seriously. This is unreal. It's been 3 months since release and this is a MAJOR bug. 1. Users "may" experience it? In reality this should say, "Users do experience in every single CFM user game and have experienced since launch and it will take them 20-35 seconds of the play clock to pick their plays." 2. How can they possibly say this is a priority when they fixed a bunch of other stuff and this isn't fixed? This is ridiculous. What a load of garbage to say that it is a priority. Near bottom of gameplay fixes. Going to play games to see how tuned it was. Too late. I'm on to other games now. If all this works (and doesn't break anything else)...this is good stuff as far as gameplay is concerned. Only really noticeable omission is the wind/kicking game, which can still be somewhat worked around with supersim at least. "Tuned to decrease defensive coverage ‘break-on-ball’ reactions in All-Madden Simulation Game style"
Could someone please elaborate what this means exactly? I always assumed "break on ball" to mean the instant a defender switches directions in an attempt to swat away or intercept a ball. That is to say... the instant a defender decides to "break towards" a ball that is sailing through the air. So if they tuned that reaction down, that means defenders are slightly worse at reacting in that instant. Anyone else interpret that the same way? So I guess if I am reading this right, it means defenders were tuned to react a little less quickly when a ball is thrown in Simulation Mode on All-Madden Difficulty. All other modes were left the same. Then why are you on this forum? This is a fix for defenders reacting as soon as you press the pass button they would react even before the windup and release. That's my take anyway. I'm also suprised they didnt do something about the sack-fest that is All-Madden. I have Human Pass Block all the way up to 100, and I still get sacked a ton in All-Madden. Sometimes 8+ sacks in a single game. At least the sacks against the CPU should be more realistic if they truly fixed the statue QB. Also excited about the no more blocked field goals when you have perfect timing. It has seemed like I have an kick blocked and returned for a TD against me almost every game. Hopefully, we don't have to restart our CFms. Is this new? Has anyone seen these yellow triangles next to some plays on the playcall screen before? You almost always do not need to. I think we should be good to go. That's all-pro default everything. And Eli's 50% for the game so far. 1 sack so far, but I'm not even going to try to judge that until I get a good sample size of games. Good to see the CPU isn't perfect though - that's the one thing I can say so far. Can someone please edit a quarterback on the roster and scroll through QB styles to see if they are still showing generic on many of them, or if they fixed? So it seems sim All Madden might be the way to go now, correct? Glad to see QB scrambling received attention. Optimistic about the Pass D Reaction tuner on AM. Our league runs AM with 0 PDRT / 0 Coverage. Passing is in a really good place now overall statistically, though it was rough the first half-season. Although man is used a lot more than it ever was in m17 and is generally solid if you have an elite secondary, zone is still the predominant strategy. I've wanted to raise the coverage/PDRT slider to improve man coverage, but it would simply make ZCV too overpowered. Presumably this tuner change 90% impacts zone, thus we will likely be able to raise our PDRT & coverage sliders, which will hopefully improve man coverage relative to zone. Hope that makes sense. That is the optimistic scenario, anyway. Are the same RBs still getting cut and resigned week after week in Franchise? Example, I had Jeremy Hill, Wendell Smallwood and Andre Ellington cut and resigned by either Bengals, Cardinals or Eagles every week through the season. Manning sacked 4 times in my first game, goes 17-26 168 yds, 0 TD and 1 INT. One was a busted screen pass that he had no choice but to eat the ball on, the other 3 had a bit of statue to them but nobody was really open. I counted at least 3-4 incompletes that were clearly off-target passes. Again, one game is not enough to say anything either way. But this matchup did generate a ton of sacks before the patch so 4 over a full-length game isn't unreasonable. Penalties are nearly nonexistent at default still, as expected. There was one false start and one neutral zone infraction. Will be bumping those back up soon. I want to be the first to jump in here and say they did a great job with this patch. I was very vocal with my criticism earlier, so I'm going to be vocal with my praise now. They tuned QB behavior in a really nice way. I played Matt Ryan as CHI and he took just 1 sack on a busted protection, while completing 63% of his passes. I noticed that he responded more quickly to pressure, moved more intelligently, and got the ball out quicker, all without going Robo QB. He missed on several throws.It also looks like they sped up the release animation, which is a good thing. I was on All Pro with King's sliders and I got great game play. I know the arguments about sample size, but I have played this game so much that I know instantly when something is different. From what I saw, it looks like they got QB AI significantly improved. I'm stunned. It also looks like the bit about creating separate thresholds for each accuracy range has a real effect on the game. It looked to me like more intermediate passes were off the mark with Trubisky than before. That's also a welcome change. Spy Crash and QB Contain are your friends. Zone defenders in Madden play deep-to-shallow by default and prefer to stay back against passes as to avoid getting baited and having the ball thrown over their heads. You have to use Spy Crash to trigger the CPU-controlled defender to break out of the (arguably conservative-to-a-fault, certainly conservative) zone behavior and attack the scrambling quarterback. Fortunately you may trigger Spy Crash while the QB is still behind the line of scrimmage. Obviously in man coverage you're conceding the QB scramble unless you spy or use QB Contain to mitigate that. Spy Crash won't help you there. As to the CPU defending a user-controlled scrambling quarterback in a single-player game, that's obviously still an issue. My Xbox can't get here any sooner. Tomorrow should be the day, thanks guys. Two of the some of the OSer's opinions I care about came through. Would love to know what this is as well. Wild guess: maybe you can somehow tag favorite plays? Lord Can they just disable the "pass commit" feature for the cpu in Sim Mode??? Downloaded the update, started playing as my Dolphins against the Panthers to gauge Cam Newton's responsiveness to pocket pressure. Improvement is noticeable. I'm blitzing on every play (not trying to win, just want to see the patch adjustments). One quarter of play, maybe 12 defensive snaps for me. Cam scrambled to the left or right out of the pocket three times. He didn't run with the ball, instead opting to pass downfield, but he did indeed leave the pocked under pressure from Suh and Wake. He also roasted me on a QB Power run. i thought the accuracy threshold tuning was stated as competitive mode only?? im glad to see they addressed cpu qb a.i. but what about autosubs and fatigue?? still impossible to give 20 carries to rb1 and 10 to rb2 without manual subs?? does cpu rb1 still carry it 30 times? penalties still being non existent when they touted them working in sim mode this year bugs me. Follow-up: gonna double-check this myself, but in a message with RG (one of the EA Sports Madden competitive broadcast personalities), he said that the yellow tags indicate which plays are set as audibles in a given formation. Could have been random re: the extra missed passes, but I saw both QBs miss throws they normally don't. I've played this exact matchup probably 25 times, as it's my default test game for sliders, etc. Re: fatigue, I can't tell. I use formation subs to manage this. I'm not gonna blow sunshine on their fatigue and sub system. It doesn't work like it should. I have no idea if it's better or worse. So far, so good. Playing franchise with all-madden default sliders, QB play is greatly improved. Even challenged a sideline catch made by the CPU and the call was overturned into an incompletion! Only gripe is that I had one running play where the o-line pancake glitch was triggered. Lol Road I have been sitting on my couch hating having to use my phones hotspot for internet to download this patch. I thought things was terrible having to sit over an hour to download. After your post.......s*** things are great waiting on this slow download. Hope you are back to playing tomorrow!!!! playing on all madden and custom sliders and it does play a lot better. passing game seems to open up more, no more cpu defenders jumping out of no where to deflect a pass or int. qb play seems better on both sides including accuracy. I saw multiple off target throws by both qbs. Small sample size but the sack issue seemed addressed. All madden play is back in business. Seemed a lot smoother overall. Definitely an improvement to what we had. Its just a shame we are going on four months into this cycle before anything is really addressed that was a glaring issue from the start. I have to wonder if a madden release every year is too quick of a turn over for the developers. They are taking way to long to work out the kinks and rushing the game and ultimately killing the fan base. I am happy i can fire up madden again and get my football fix. Yes, Fatigue & penalties. In all honesty I've given up hope with this team regarding these two areas. It's been what 4 years and players are still disappearing from the game, inexcusable. Penalties have taken a huge step back with Defensive Holding not being in the game anymore were they finally added it a couple of years ago. Not to excited about the patch in all honesty. The CPU Qb issue should of been fixed prior to release since it was a issue last yr already. It's almost December and it's the first patch that actually calls out "sim mode. Sorry not impressed but let down this year. Thank you, sir, you bet, I will be in action tomorrow. Repair guy called after I made that post and said it will be ready by noon. Whoa, can't believe how much better the QBs play and move around. There's no mistaking the scrambling being fixed. Definitely took long enough, but this is a well done fix. I think Longshot and Frostbite were the killer this year. Clint was talking about penalties on Twitter a few weeks ago and saying they need to get fixed or something similar to that. I knew at that point it would not be a title update, but included again in the game at some point. I agree with milticket, the QB issue was reported last year and just getting it fixed now, not a good look. DH was working and they took it out. I've been so used to penalties not working for a long time prior to that, I'll wait till hopefully next year, but still, no excuse. I am glad the CPU QB AI is fixed, that opens up the game some more with different strategy and what not. Kinda sad when a publishing company practically says “Here’s a bunch of sliders, fix the game yourselves while we occasionally work on it.” Well, that seems to be the case, I could be wrong. While M18 is fun sometimes, I’m definitely skipping on 19 and possibly 20 unless there’s a drastic change/overhaul. This statement comes from after two games played, where it feels like nothing’s changed. Let’s hope I’m proven wrong. Based on other people's feedback, CPU QB AI isn't working for you any better? Guess I need to further take a look at that. What's really great about the QB AI changes is you see that moment when they set up in the pocket, and where before they would just remain in that setup like a statue looking for a passing option, now they'll move out of it relatively quickly and adjust to the direction of the pressure. You'll see QBs scramble a bit, and react if an option comes open, but it all happens in a very smooth a realistic looking way. It's not herky-jerky and broken looking like QB movement has seemed for a couple years now. Honestly surprised as hell here. Maybe that last bit is what surprised me the most. Foot planting and animation for QB has always been pretty disjointed and weird. The QBs blend out of a throwing set up to movement and running really nicely. QBs are still incredibly dumb for me. Even under duress, they refuse to get rid of the ball. Russell Wilson won’t leave the pocket. In a game right now where Cam Newton was sacked three consecutive times (playing offline exhibitions against mobile quarterbacks), he hasn’t moved around. Thanks, something I will look out for tomorrow when I get the console back. All of these positives with the CPU QB AI and one negative, it needs further looking into. Edit- I never trust exhibition games for testing purposes, I just prefer testing in a regular CFM. Second post-patch game I'm doing is a CPU vs CPU (via slow supersim) week 1 KC vs NE. Smith has scrambled 3 times for 29 yards and has been very mobile even when he wasn't running. He did do the old throw-back-across-body thing once that resulted in an illegal forward pass though - I'd rather have not seen that. Even Brady took off running one time for 9 yards - and fumbled. Sacks late in the 4th are NE 0 - KC 2 . After turning the penalties back up I also got a DPI call and two facemasks. Yes,from the couple of games I played I think it is certainly improved and I've been annoyed at the game since last year and have always went back to '16 because of this. Does anybody have any issues with scouting players? When I hit Square to get their attributes it doesn't show up unless I hit X to view the players profile. Once I back out of that screen then the players attributes are shown on screen. Actually had a breakthrough! Newton started scrambling and looking like himself. It’s sad how relieved I am. Thanks Armor and everyone else... Somehow that slipped past me...looking forward to see how well! Armor, I assume there will be some changes in your sliders as well? Wonder if they fixed the issue in CPU VS CPU (coach mode) where the player you are controlling won't move. Seems like 7 patches later that's not even mentioned. Are players still randomly walking right through the QB's body when breaking the huddle & walking to the line of scrimmage instead of contextually walking around him? Are players still walking through other players bodies lying on the field when getting up from tackles and pile ups? Has the collision detection been cleaned up at all? This is what's stopping me from playing Madden. The frustrating thing is this stuff was cleaned up in Madden 16 & it's hit or miss now so that's why I keep harping on it. It's not like they can't fix it. I understand that a little clipping is going to happen in a video game, but players walking right through bodies should not be happening going into 2018 smh. That's not a glitch, it's by design to increase the game's skill ceiling for competitive play. If you've selected a team at controller select, you aren't playing CPU v CPU. If you do want the CPU to move your player for you on defense, you may use the player movement assist by holding L1 / LB as soon as the play starts. This will allow the AI to take over movement for whatever player you are controlling. Note that CPU movement assist is disabled on All Madden difficulty. Anyone know if this applies to existing offline CFMs? Or would I have to restart my cfm to get the qb ai fix? Now, I can't wait to fire this up tomorrow and find out if I can recreate this scene vs what is being reported here at OS. Assuming those are custom rosters, which is something I don't use. Maybe I can finally start a legit one...just been doing alot of testing in cfm but never started a real one...No better time than Thanksgiving break! Just my 2 cents so far after this patch.........this patch has been a success and a game changer for me. Great job EA, and thanks for this patch!! Which penalty sliders do you turn up? and by how much? Also, are you playing with default gameplay sliders? Looking to boost some cpu sliders. Cpu accuracy at 15 is low now. Cpu is missing a lot. 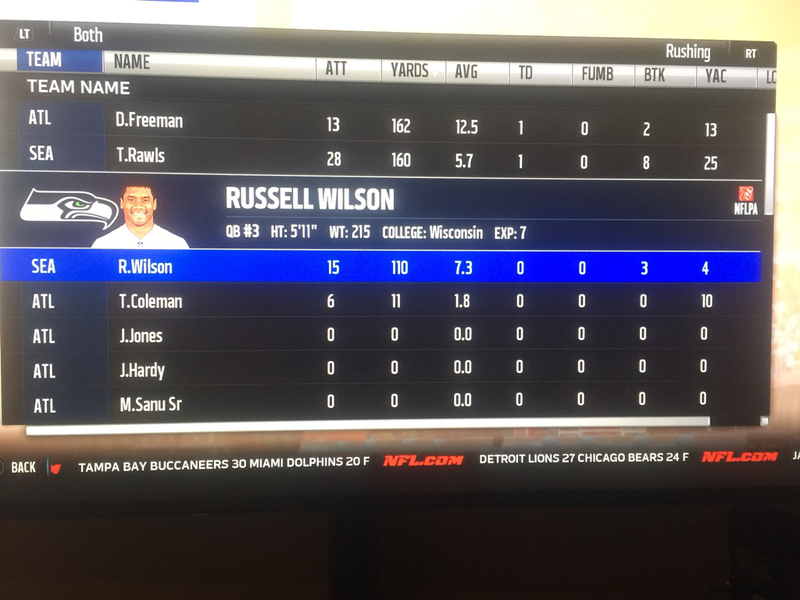 Just played a game on all pro - sim. Statue QB is still very much alive. One game is not a representative sample size, so will keep playing it anyway as I have all season. Overall not impressed with the first game post patch. First game with the new patch....after not playing for about 6 weeks. Saints (me) at Eagles. I’m down 17-10 at the half. Both Eagle TDS were Wentz scrambles. The AI QB seems to get rid of it faster as well. He’s also had three throw aways. So far so good. Wentz-3 Carries 28 Yards in the first half. Several trusted OSers say, so far, so good, CPU QB AI movement pretty good. A few others say, not so good, statue still prevalent. I suppose it's par for the course. Should be interesting to see what I discover tomorrow. This has a Madden release day feel to it. It's going to be a long day at work tomorrow after a long night of Madden! I'm back in love with this game!! Update: QBs don’t slide when they get out of the pocket. Ryan Tannehill fumbled four times against me on six attempts because he refuses to slide. Classic case of something being broken in the process of fixing something, unless this is solely an issue with RT. Update: QBs don’t slide when they get out of the pocket. Ryan Tannehill fumbled four times against me on six attempts because he refuses to slide. Classic case of something being broken in the process of fixing something. I will say I've seen more QB fumbles though - sacks or otherwise. I mentioned Brady's tried to take off a few times and he's been the one losing the football ( twice in the 2 CPU games I've watched - same matchup while I was eating dinner) At the moment my fumble slider is still on default. Animation game play. It has ruined Madden... Anyone see another Moody video pointing out that Madden was to be animation free back in M13? Weren't people hitting the wrong button for QB slide once the game was released? I thought Clint had a discussion about this on Twitter? I've watched a ton of his videos and to be perfectly honest, he almost seems to look for problems. I've never seen somebody devote so much time to countless videos depicting what is wrong with the game, some of it totally legit while some of it is really reaching. I don't care what game it is, if you look as long and hard for problems, as it seems this guy does, you're 100% going to find what you're looking for. Having said that I traded Madden in a month ago or so this is in no way defending the game or EA for that matter but having seen this youtube guy mentioned twice in the last few posts I felt compelled to say something. Much improved, having fun with the changes. Playing more contain and spy...Dak taking off on me playing against Cowboys...maybe even too much, but he’s throwing well on run, true to life. I watch Moody a lot and agree with you on some things, but if you’ve played the game in real life (I don’t mean to put myself on a pedestal), then every little error seems to be magnified and infuriating. The pocket mechanics featured are simply inexcusable. 100% he looks for problems...but i also think he is just playing and things pop up and present themselves to him. he is looking for issues and things missing from the game that should be in it in 2017.
he also compares how things function compared to nfl 2k5 and all pro 2k8. and he is 100% justified. look at the year to year effort from 2k...or the show...fifa etc..
madden is by far the least amount of features, upgrades, improvements in gameplay. from a year to year basis than Any other sports game and it isn't even close. Traits not triggering QB’s to scramble was my biggest issue, so now I’m off to enjoy my solo CFM!!! Good job on the AI QB Tuning!!! Not seeing that in my first game. Wentz finished with 61 yards on just 6 carries and if he wasn't going into the end zone he was sliding...every time. Only one game so far, but I may start playing Madden again. I haven't played a Franchise game since September. Wait, he has credibility? No. Just no. Are you guys seeing less injuries? 2 games in franchise with injury slider at 40 and seen no injuries thus far. Anyone else? Sorry, I thought I heard him say Joe Greene in the video a few times. The football through the helmet wasn't a good sight. If you believe that, I have a bridge to sell you. That guy never just plays the game. He boots up to find **** whine about. Full stop. That's how he makes his money. There was a zero percent chance he wouldn't have video up calling the patch a failure. Zero. Moody makes solid points and is correct that the animation game play in madden is trash and has been trash for a long time.. I've played two games so far post-patch and there were a few injuries between myself and the CPU team. I didn't notice any difference. Guys keep this thread about the patch. Playing all Madden on competitive. Qbs actually run the ball. Practiced against mariota and Newton and they both scrambled on pass plays for tds. Anyone else think All-Madden Simulation was nerfed? Since there's some varying opinions on the AI QB and if they scramble or not now when under pressure, perhaps we need a separate thread where we can list out what difficulty, game mode, quarter length, roster used, sliders, penalties and anything else that may be of relevance. The data could help us determine what settings to use that would provide a greater chance of AI QB's actually moving away from pressure. Ok cool, I thought it was just me being ****ty at passing the way CPU defenders were all over my passes deflecting and intercepting like crazy on All Madden. I'll have to boot up again and check out this "defender reaction time" on All Madden. Still can't believe after all those, they have yet to touch the game logs and career/season stats for individual players in Franchise. Played a few games and QBs started sliding again. Had to bump the Fumbles slide up, though. Good to see Tannehill scramble and turn a busted play into a decent one. I will say, though, the statue QBs aren’t totally eliminated from the game. I’ll get them once, maybe twice a quarter, which is a huge difference between 1-2 a drive. Overall, the patch is pretty good, but it feels like they left something out. Can’t quite put my finger on it. Enough, keep this thread about the patch final warning. It's hard for me to fathom that anyone could play even one quarter and not see that the CPU QB A.I. has been improved exponentially. There are still some weaknesses, e.g., the QB when trying to scramble up the middle will occasionally crash into the HB or an olineman and on some outside scrambles will still try and throw across the field instead of scrambling for a short gain. On All-Pro Sim, in the one game that I played I saw zero "statue" plays where the QB just stood there and took a sack. There were several scrambles for modest gains with the QB sliding down each time. There were scrambles outside the pocket with ropes thrown to to receivers on the sideline. There were throwaways while being chased and pressured. There were passes to sideline, down the seam, and check downs that came after the QB stepped up in the pocket. The CPU's ability to climb the pocket and make throws may be the best improvement. This was an 82 OVR QB playing better than any QB has played against me in a long time. I have an 85 Bears like defense, so I got some sacks and some picks, but the QB made some plays and was competent. What is interesting is that the Throw on the Run rating will be much more important now for the CPU, because they will make a lot more throws while on the move. This QB probably had 5 or 6 bad throws that were a direct result of his TOR rating not being that great. He missed another 2 or 3 throws that were just off-target. The movement stuff is clearly improved for the QB, but I feel like their they've improved their decision making also in terms of who they target in the passing game. More games will give me a better read on this. Some other stuff has been tuned up as well. The game is of course still Madden, so if you don't like the core gameplay it's not going to be better for you, but this is finally a good get for the User-CPU crowd, IMO. I'm not going to do it because I need to go to sleep, but I really want to play another game right now. I'll second everything here....it's a huge improvement...honestly, I didn't expect that EA would pull it off this well. Yeah, there are some oddities with scrambling logic at times, but I also suspect ratings/traits (like BCV) play some role in them. I'm really pleased with how this turned-out....the rest of my gaming collection is going to be gathering dust for quite a while. I'm glad that you reminded me about the BCV rating, upping that for the appropriate QBs should improve things even more. From what I've seen, it definitely should. I've seen instances where higher BCV QBs navigate the middle much better than lower-rated guys. Wow great patch Qb Al now good. Have to defend Qb scrambles now. Anybody else not seeing penalties now? 2 games, default all pro and I haven't had any. Strange. Disregard the first post. Turned everything to 51, except PI, and had about 6 penalties last game. I would be shocked if anyone hasn't seen any change in the QBs. First game I've played against Dak he immediately took off up the middle the first two plays and I immediately started setting a spy in the middle. I almost feel like they do it a little too much. It seems like the CPU QBs actually make some bad decisions and try to force throws. Before they used to almost always find the receiver and make the perfect pass where nobody on defense could even make a play on the ball at all. So far, it's been different. I played a game before I read the patch notes and it was remarkable how the scrambling style QBs (for both teams in coach mode) moved away from the pressure and . . . scrambled. The Patch is Amazing thanks EA For your hard work this by far is the best madden to date your team should be proud. Personally, not seeing any QB improvement in All-Pro, default sliders. Won 70-3 in 5 min quarters. They literally wouldn't block the man blitz and the Qb just stood there. I had 15 team sacks and they had 0 total yards.... Not sure how that is called fixing QB play. can anyone post a pic of the new white color rush Pats pants? You can def. notice a difference in the CPU QB play. In the few games I played on All Pro it played pretty well.. I'm not sure if it's just me, but I feel like they nerfed coverage? I felt like I could throw anywhere I wanted to on the CPU..
Has anyone looked at what the qb type does? I am interested in whether there is a difference in how qb's play or do they all play the same? So it's safe to assume that penalties, fatigue or auto subs weren't addressed in this patch? Perhaps we will see these issues resolved in a sim tuner updates which EA talked about before release. After several games, I started my CFM. Opening game against Seattle, Wilson ran 10 times for 54 yards. 6 were designed runs, the other 4 were when he took off when pressured. Best game of Madden I've ever played! I threw a late pick near their goal line and lost 17-13. Shockingly better gameplay. Now, if they'd fix the penalties, I'd be golden. Need to tweak CPU passing a bit, as he completed 75% of his passes. Also need to tweak the running game...neither team could run, running backs averaged around 2 ypc. But these issues I can fix. All Pro / Simulation / 10 min QTR / Default Sliders / Coach Mode "ON"
Don't want to hear the word "placebo" this game is so much different now. Both QB's had extreme happy feet and not only scrambled when needed but moved side to side in the pocket throughout the entire game. I saw over throws, under throws, bad throws you name it. Only two things I noticed were....****shing yards were low on both sides but you see the teams I used and there was not one in game injury. In all honesty it amazes me to say this game almost played out perfectly. I was looking to nitpick but really can't. This is the game that should have shipped 7 patches ago. Patch is looking really good, boys. Played 2 games - loving the results. As a heads up, I strongly advise testing and experimenting with QB PLAYER TRAITS. With QB scrambling enabled, TRIGGER HAPPY is radically different than IDEAL. I'm going to be testing more this week - but I strongly suggest taking any mobile QB's from trigger happy --> IDEAL. On Trigger Happy, they take off far too frequently for my taste...sometimes resulting in them running directly into pressure. But on Ideal, I just finished a game against Tyrod Taylor...and it was beautiful. Only 1 sack surrendered (on a blitz). Ran when appropriate, made off balance throws. Awesome awesome awesome!!! The two Sky Cam games on NBC made me realize how ridiculous the CPU defense is on All Madden. I'll need to check it out over the weekend as well. I personally think All-Madden was nerfed a bit (in a good way) I find it to be a reasonable challenge instead of being overly challenging and being a sack-fest. CPU QB statue issues seems fixed to me, in my Pats CFM vs. KC, Alex Smith scrambled for running yards and/or threw on the run successfully several times. Before... those plays would have ALL been statue sacks. I'd say I only saw 1-2 "statue sacks" or what I would now call "near statue sacks." Before I was getting a statue sack almost every drive. The statue issue is better now. I think passing was made easier for human controlled teams. Might up CPU pass reaction and pass coverage a bit. Also the CPU seemed to have a harder time running against me. Might up CPU run block a bit. For me, the biggest issue on All-Madden was too many sacks on both my QB and the CPU QB. Now the CPU QB actually scrambles and throws out of sacks. They also seemed to speed up release animations and throw-away animations, this makes it (thankfully) possible to throw away out of sacks as a Human Controlled QB... so I too am able to scramble and throw away more often... thus my biggest gripe with All-Madden seems fixed. I am getting way less sacks on both teams. Which is a good thing. Im glad to hear good things about the new patch, but its embarrassing that it takes several patches every year before gameplay can be acceptable....especially when certain things will be broken on the retail release that were supposedly fixed via patch for the previous version. How are these fixes not automatically integrated into the next Madden as soon as they patch it? And before anyone comes at me for knocking on patches, Im not knocking patches in general. For big NEW features, they are necessary.....but there are certain things that are broke at the retail release, patched, and then are broken again in the next years retail version for some reason. Thats pretty unacceptable IMO. I agree 100%. This is also why I'm fine with certain sports titles skipping a year in between. If we have to already wait 3 months for the game to play the way it should have at release then what's the point. All-Pro Simulation using my slider set up and house rules. I am very very pleased with this patch and it is a great surprise. Madden 18 is now officially the best madden game they have made ever. CPU QB AI has been greatly improved. It is still wonky here and there, but no where near the brain dead conundrum we had with Madden 18 (and Madden 17 to a lesser degree). QB's have pocket awareness now and ratings are mattering even more with BCV, Carry ratings with fumbles and the QB Accuracy (I have both CPU and HUM set to 40) is on point. QB's now move their feet, move side to side or step up in the pocket, and also scramble and slide. It's beautiful. We are back into our CFM and 1987 season replay full force after I shelved the game for going on 2 months. Statue QB does happen once or twice a game.....but not every drive like pre patch which for me destroyed this game and had me playing Madden 16 again (which BTW is still a great great game with the classic rosters). Madden is back. Thank you for addressing this issue Tiburon!!!! I had been waiting to hear your analysis of the update. After reading your post I'm excited and I think im gonna give the game a shot again, thanks! No one will come after you because that opinion has been expressed here before and it's a opinion to consider greatly. The difference is pre internet days, you got what you paid for you 50 bucks, warts and all. We live in an era where something is wrong with a game, there is instant notifications(you tube, Twitter) and a title update will begin. There isn't a sports game I own that doesn't require patches to fix issues. Not an EA only thing. I'll be testing this patch out in a few hours. Edit-ProStylz, the difference for Madden is the yearly license with the shield. This patch and the sale price have me tempted to do the same. The first game I played post-update was against Carolina in season 2 of my Saints franchise, and there was very noticeable difference in the way Cam Newton reacted in the pocked. It was my 2nd game against them in the season and right away it became clear that he was much more willing to take off and run than he was in the first matchup. I didn't have a chance to play a 2nd game yet but from a one game sample I like what they did. Game 2 post patch completed. I wanted to test two different games with the Browns, first was against the Jets as I said in my earlier post. McCown was 17-36 and I won that game 13-6. This game Goff killed me, as I was hoping. He threw for 311 and completed 80% of his passes. Gurley ran for 73 and a TD and caught 5 passes for 66 yards and a TD. Honestly if Crowell didn't have that long td run before the half it would have been a sleeper. Two full games still no injuries. Don't know what's going on there post patch but at this point the QB's are playing so good I will sacrifice the injuries. I'll probably bump the injury slider next game. Guys......as Armor said, we have something good here. It honestly does not even feel like the same game......Madden 18.5 has arrived. Is it me or is there a huge amount of drops now? Just played 4 games and in each one if a defender so much as breathed on a player they dropped in on both sides. Averaged 16 drops per game from both teams. It has been pretty ridiculous because most of these are on uncontested balls that get dropped. This is on offline CFM, also when my WR drops it with no defender around him the announcers go on forever about what a huge hit it was when there wasn't even contact, it gets annoying fast. CPU QB AI has improved a ton though, no more statue. Also noticed a lack of injuries. Even bumped up the Injury Slider to 80; the little “Injury Timeout” icon flashed, but there’s no injury. As I’ve said before, it’s a decent patch but it still doesn’t have Madden 18 where it needs to be. The patch is golden. I'm really enjoying the game more. Are you saying nothing showed up in the injury report? Because seeing the "Injury timeout" banner without an actual injury scene means the injury was off-ball - not involving the ball carrier. It's been like this all year and was a design decision for '18. If you didn't get a pop up a few plays later or nothing got listed in the pause screen injury report, then there'd be a problem. I had several minor injuries in my first game (playing at the CFM default of 40) and all of them showed me a pop up and were listed in the the report after a few plays. im curious what ppls thoughts are on zone coverage (user and cpu) and man coverage..especially against high speed guys. curious about user accuracy as well...all throws on target or do you have misfires?? i get u can jack up penalty slider but this can affect gameplay negatively. i do not have madden 18 anymore. and outside the cpu qb ai issues...these were the other things that bugged me. Try catch at 52. That was the sweet spot on release. Seems to be back to that. In talking to Clint it sounds like the "break on ball" change for All Madden was simply tuning it to the same as All Pro. Just played my first game after the patch and it feels like a totally different game. Played against the Bills and Taylor took off 8 times for 88 yards. Yeah, i agree, EA didn't disappoint. This patch could potentially bring Madden up to the next level. Anyone else find the game playing a bit faster? normal speed seems to be sped up a notch, but on a very limited sample size. The next game I played post patch was as Jacksonville against NE. I sacked Brady 7 times. Obviously he's not as mobile and none of them were statue sacks. I would just hope that Brady would adjust. Went to the next game as the Bears playing San Francisco. First play of the game Beatherd takes off for 8 yards. Da_Czar talked about this in the sim hangout last Friday from a 2K Developer perspective. He said like many jobs, people get moved around so the dev that worked on a certain part of the game last year might be working on a different part the next year, when that happens the new person has 2 options, continue to build on the last person's code (which may be a mess already and hard to work with) or rebuild the code from the ground up. Makes sense to me and even though I AGREE WITH YOU about patches being integrated into the next version, I think Madden may be doing the same thing Da_Czar spoke on. No injuries popped up in the report. The only injuries I saw were on defense, but I only play offense. Not sure if this is how to embed YouTube videos.. But here you see QB scrambling on all Madden sim, post patch. Yikes. I am not sure how you did it. I have only played one game so far; admittedly, it was against the Rams (generally a tougher team to sack in Madden), but, trying my hardest to get sacks, I was only able to get 2 against 28 pass attempts (actually below the Cowboys RL sack rate), and both of those came on a combination of Aggressive Pass Rush and 6-man blitzs. Obviously one game, but, previously, had a applied the same strategies, the fewest sacks I had seen in a game as 4. Are folks seeing good CPU QB scrambling/movement on All Pro? It's never been an issue on All Madden, hoping it's fixed on All Pro. Most definitely is much better. In my opinion, default all pro has never been better. The computer plays like it's actually trying to beat you.Seeing more animations and more dynamic play. McCown took off once for a 40 yard run and they actually have awareness. Players ratings matter more also. Fatigue is removed from the game (almost entirely). I actually saw more dropped passes causes by hits on competitive than on sim but after 2 quarters with this patch I already see a noticeable improvement on all-madden sim. I'd encourage people to mess around with the penalty sliders to get the numbers they want because I'm not seeing it really have any adverse effect on the gameplay so far. The only ones I'm planning on leaving at 50 right now are false start (because it needs to be capped otherwise it will happen a lot) and roughing the passer (because it's that thing where the QB falls over if he gets breathed on). All the others are fair game. The only two calls I've not seen since the patch are OPI and Defensive holding, and as we know D holding is basically nonfunctional and I've had one OPI in the entire M18 cycle. I know everyone has their opinions on whether or not they affect the gameplay, but please...just try it. Having the AI offense not self-destruct due to excessive sacks changes the gameplay by itself in so many ways that at times it plays like a completely different game. Now this is what I've been waiting to see, a patch that improves the CPU qb! Now I can find the game cheap or less than half retail price. Merry CHRISTMAS TO ME! Thanks Tiburon Team! Did this patch improve Sim Mode? Put me in the camp that noticed a huge difference right off the bat. Normally I kill it with Sheldon Richardson but in 2 games the damn QB has moved all over the place. Big improvement imo. can someone please comment on man coverage on streaks? zone coverage?? and if you can run slants all the way down the field?? Most likely called you picking cheese plays on both offense and defense to take advantage of the computer. So, I️ heard this patch might help cpu qb AI and scrambling. It happened to workout that I’m in season 2 of falcons chise and the nfc title game was me against the only team I️ lost to all season, sea. The first game of the season was a great game, actually, and Wilson looked close to real life Wilson in that game, even (before this patch), and he beat me on the last play of the game with a 20 yard TD pass as time expired. So, now I’m playing them in the nfc title game with this new patch. HOLY CRAP!! Lol. Seriously, Wilson was ready to run. I️ don’t have the stats in front of me, but he had 50 yards rushing, easy, and made some serious jukes a few times, lol. Occasionally, I’d say he ran too soon, but that’s better than what the game has been so far, so that’s ok. This game went down to the wire as well, actually. I️ went down 20 in the first half with 3 ints. And, Wilson had 3 TD passes in that time. I️ came back in the 2nd half, fought like hell, but Wilson beat me, again. Specifically, Wilson. His scrambling helped them A LOT. Picking up a few first downs on 3rd down with his feet. I️ lost 45-42. Their D was prob the bigger story of the game (even though they gave up 42, it was a tough game). But, AFAIC, Wilson absolutely looked like Wilson and his scrambling was much different from anything I’ve seen in M18 up to this point. Only 1 game, but it happened to be against a mobile QB in a title game, so I️ think it was a good benchmark. I️ play all-pro default sliders, fyi. Ever since this past update I've been having issues when scouting players in my franchise. Has this happened to anyone else? Is this on a existing franchise or a new one? If on an existing, it might work itself out the following draft. I don't think the "projections" are anything that critical and it might just be more of a visual bug than a "Real" one. Good to read this, man I don't have the game yet but, definitely have the Madden itch now lol.. Any Videos you guys want to share(Post Patch)?? Yeah, I started my Packers CFM, so 1st game of the season was against Wilson. He killed me with his legs...2 rushing touchdowns. I lost 17-13, throwing a late pick in the red zone. He rushed 10 times for about 54 yards. 6 were designed runs, 4 were avoiding pressure. I ended up with 4 sacks, bit 0 were from statue QB. DEFINITELY like playing a different game. Most of you know how critical I've been of Madden, so I am eating some crow by saying this. However, in the games I tested the patch in, and my first CFM game, I have to say these were the best games of Madden I have EVER played. Now, if I can tune my penalty sliders a bit, and EA can beef up presentation and CFM in 19, we may finally have something here. So, GOOD JOB EA. Words I never thought I'd hear myself say. Does human OL still pancake unrealistic the cpu DL. Ending games with 5+ pancakes? This was introduce on patch 1.4 oi believe. Others have already articulated an impression that struck me after playing a whole bunch of games post-patch. It feels like a completely different game in a good way. I️ should’ve captured some clips of that sea game, but didn’t think to. I️ captured a few big plays from Freeman, but none from Wilson. Here’s a snapshot for proof of Wilson’s running, however. Lol. 15 for 110. Pretty sure they’re going to have to nerf running QBs, soon. . But, in all seriousness, that one game was solid. In the pre-patch game (I️ also lost) against sea, Wilson did NOT run all over the place. This feels like a pretty fair comparison. And, just overall, I️ enjoyed the gameplay a lot. I’m pretty happy where the gameplay is right now. Again, all-pro default, also. No messing with sliders, and I️ get enough of a challenge. I️ went 15-1, of course, but I️ had some fun close games in that mix. But, if cpu QBs start playing better with this patch, M18 is worth getting at this point. And, if u have Xbox x, it’s even better/smoother. Is there any way to include injuries on All-Pro Competitive? I’m playing with the slider up to 80 and haven’t seen one. No injuries on competitive mode period. Here's ARod taking off on me four times for 39 yards. I left the recording to go to the play screen on a few of them to show they were in fact scrambles and not QB draws. I especially liked the one where he darted straight up the middle while I was in man on the FB. This can change the way you approach your defense. In this case it didn't because the game wasn't close, but if you have to account for this in a close game it changes everything. It's the reason a spy exists, and that was never needed in M18 (or in the last few Maddens) because the CPU would rarely run with the quarterback. That's why it was so important that EA fix this part of the game, and they appear to have done it very well. Last game I lost 19-2...didnt score an offensive point. 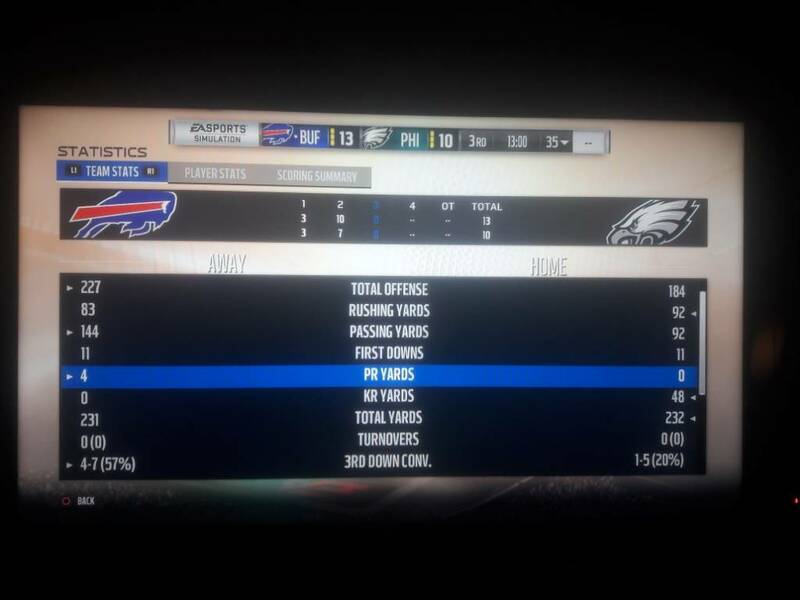 This game I won 62-3 against the bills, I was the seahawks.. Forced 8 turnovers including 3 pick six's. I really like how it's playing right now.. I had lost several in a row before this odd blowout game. PS, I played as Dion Jordan to spy Tyrod Taylor the whole game.. He still had 48 rush yards at half on scrambles. I hope they don't change anything with how the CPU QB is a threat to run now. So yeah, this is like playing a different game. Playing the Panthers now and Cam has taken off three times and it's in the second quarter. Last game Dak took of on me like 4-5 times. QB's are getting back further in the pocket and not just waiting to get sacked. Obviously a very small sample size, but positive things so far. 15 for 110. Pretty sure they’re going to have to nerf running QBs, soon. Please, no. Don't even mention it. It's not like Tom Brady is going to run for 200 yards on you... You played against 1 of like 3 QB'S that can run as good as they throw. I'd rather have the scrambling stay EXACTLY how it is now, and let us adjust our gamelan just how it has to adjust in real life for dual threat QB's. I'm just so impressed with how well the QB movement and scrambling has been done from a situational logic standpoint as well as animation. The transitions from pocket passing setup, to scramble, to a throw on the run happen so smoothly and look so good. This is the new benchmark for QB movement, and if it ever reverts back we'll point to this patch. Lol. Oh, I️ agree. I️ was mostly being sarcastic. I️ just said that cause whenever they make things work correctly/realistically, the comp crowd complains and ea nerfs it. Lol. I️ don’t want this nerfed, either. Watching Wilson actually play like Wilson was awesome. And, legit, I️ was changing my D ALL GAME. Qb spy when I️ thought that was best. Calling qb contain from preplay controls. Worrying about blitzing and having him run right through it. Changing the coaching assignments based on whether I️ was up or down or close in the game. It felt like a real game. So, yeah, I️ don’t want it nerfed, either, and am curious to play some more and see what average QBs look like. Hopefully, they scramble a few times per game as well. This should help lower sacks as well. The first 2 seasons in my CFM, I️ broke single season sack record 3-4 times with 3-4 players. Lol. Beasley had 37 sacks, I️ believe. I️ think I️ had 3-4 players with 20 sack seasons. If the QBs scramble a little more, that should take away a few sacks. This...patch...is...AMAZING!! Point blank period! Im out, having too good of a time playing right now! By the way, Tom Brady hasn't scrambled 1 time against me but the way he is stepping up in the pocket to avoid pressure AND throwing the ball away when necessary...JUST BEAUTIFUL TO WATCH!! Im shocked EA!!! I just saw Ryan Tannehill scramble out of the pocket, throw across his body into double coverage, and watched Stephon Gillmore ruin our playoff chances with a game ending interception. Once I realized it was only Madden 18, I stopped crying. One thing that I'm seeing is that if you're playing against a Pocket Passer who has Ideal Sense Pressure and Forces Passes on Conservative, he will make really good decisions with his throws and be very accurate as you would expect, but will take more sacks then others settings because he will hold on to the ball and not force things. I wouldn't use that conservative setting unless the CPU team has a great passing blocking OL, the QBs Awareness is over 90, or you have a playbook assigned to that team that has a lot of check down routes. Besides the QB stuff, I feel like tackling/breaking tackles is much better now in that forward momentum is respected more, i.e., unless the defender has a straight on clean shot with momentum on a ball carrier, the ball carrier is much more likely to get an extra yard or two instead of just getting automatically smashed to the ground right on contact. I also feel like defenders in man coverage take better routes to make a play on the ball now when they're in good position. I also like how wide open drops play out now. There is a fluidity to the animation sequences that doesn't scream "bad dice roll" in the way that drops have in the past. I laughed when I read this, because it is so true. no but calmly, maybe after the superbowl m18 will be decent or at least playable, good job yeah your are great Ea's!